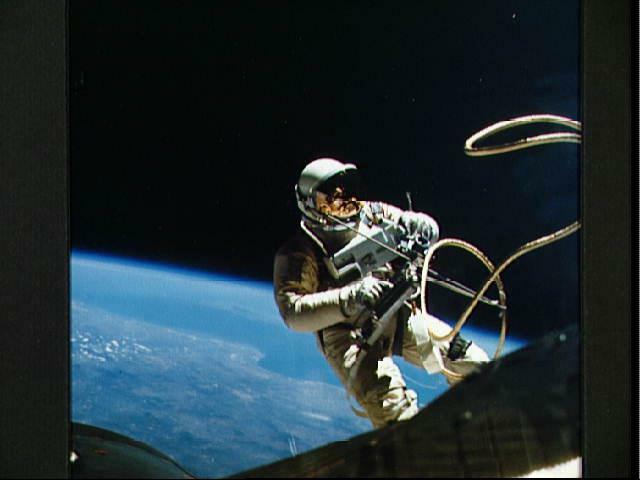 Explanation: Pictured above is the first american astronaut to walk in space: Edward White. White is seen floating outside the Gemini 4 capsule in 1965. The term spacewalk is deceiving since astronauts do not actually walk - they float - usually without their feet touching anything solid. White was connected to the spaceship only by a thick tether. He carried a Hand-Held Self-Maneuvering Unit which expelled gas allowing him to move around. A maneuvering device is necessary in the free-fall of space since there is nothing (besides the spacecraft) to push off of to guide movements.